Honinbo Shuei (本因坊秀栄, Tsuchiya Heijiro, Hayashi Shuei, 1 November 1852 - 10 February 1907) was the 17th and 19th head of the Honinbo house, as well as the 13th and final head of the Hayashi house. He became Meijin in 1906. Born Tsuchiya Heijiro as the second son of Honinbo Shuwa, when the heir to the Hayashi house died Shuei was adopted by Hayashi Hakuei Monnyu to carry on the house. His name became Hayashi Shuei (Shu- from Shuwa and -ei from Hakuei), and a few years later, he succeeded the Hayashi house as its 13th and final head. 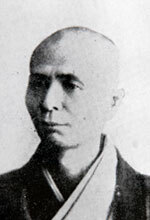 Following several years, a period of instability in the Honinbo house caused his youngest brother, Honinbo Shugen, to ask Shuei to take over as head of the Honinbo house. He accepted and merged the Hayashi house into the Honinbo house, but soon ceded the position in favor of longtime friend and former Shuwa pupil Murase Shuho. However, Shuho's untimely death just two months later lead Shuei back into the position as head of the Honinbo House. 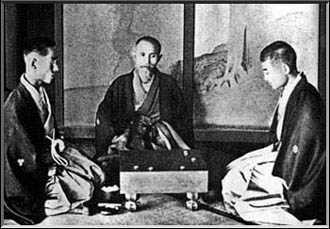 In 1906, he attained the title of Meijin, becoming the ninth person to have done so. Shuei was noted as a late bloomer, not reaching his peak until 1896 (the age of 44). However, when he did he exceeded his contemporaries by a fairly wide margin. The other best players of this period (e.g. Tamura Yasuhisa, Yasui Sanei) appear to have needed at least the handicap of the black stones to play him. During this time he held a monthly study group at his residence, thus many of his surviving game records show a very large number of handicap games as White. He also engaged in a number of jubango, and one photo shows Shuei in a fine beard (below). His mature style is marked by a preference for simple moves over complex fighting, preferring to win by out-playing the opponent on a global scale. For this latter reason his mature games have often been admired for their flow, superb positional judgement, and lack of 'unnatural' moves. This played into a deeper use of a miai strategy, sometimes revealing itself on a grand-scale, earning him the nickname "Master of Miai." He became an expert of amashi and shinogi, speedy openings, and innovation regarding the importance of the 4-4 point and center value. He is also noted for his interesting predilection of the centre- facing L-shape (see diagram). ...[Shuei] was the strongest of the Meijins and Honinbos. There were many strong players, like Shusaku and Shusai, but I definitely think that he was stronger than those two. He had superb positional judgement. There's nothing unnatural in the flow of his moves... I always have the feeling that I'd be no match for him... I'm far below his level, but I like his go. The brilliance of his play from the fuseki to the middle game is outstanding. These appear to be Fujisawa's true feelings and not just modesty since after two more questions he also says that no Japanese player is currently a match for him and that his go is on a higher level than that of his potential challengers for the Kisei title. Notable admirers of Shuei have included: Go Seigen, Segoe Kensaku, Fujisawa Shuko, Maeda Nobuaki and Takagawa Kaku. Modern professionals have called Shuei "Meijin of Meijins" & "No-power Meijin," and continue to study his games more than other player from the classical period. 1869-1871 Kobayashi Tetsujiro 4-5d 4-5d 6-1-2 Ended after Kobayashi was beaten down to Sen-ai-sen.
1870 Ito Showa 7d 4d 2-1-4 Shuei played on Josen. 1876-7 Fujita Hosaku? 5d 5d 6-0-0 Started even. Fujita beaten down to Sen-ai-sen after 4 or 5 games. 1877 Kuroda Shunsetsu 5d 5d 4-0-6 Kuroda played on Sen-ai-sen.
1884-6 Murase Shuho 8d 5-7d 5-0-5 Shuei played on Josen. 1896 Ishii Senji 5d 7d 8-0-2 Ishii played on Josen. 1897 Yasui Sanei 6d 7d 6-0-4 Yasui played on Sen-ai-sen.
1898 Yasui Sanei 6d 8d 8-0-2 Yasui started on Josen, but was beaten down to B-2 after game 5. 1900 Karigane Junichi 3d 8d 6-0-4 Started on 2 stones. Adjusted to B-2 after game 2, beaten down to 2 stones after game 6. 1865: Hayashi Shuei - Name taken after the death of his adoptive father, Hayashi Hakuei Monnyu. 1884, December: Honinbo Shuei - Upon becoming the 17th head of the Honinbo house. 1886, July: Tsuchiya Shuei - Upon stepping down and making Murase Shuho the 18th head of the Honinbo house. 1887: Honinbo Shuei - Upon becoming the 19th head of the Honinbo house. Was noted as still signing his name "Tsuchiya Shuei, Honinbo XVII" for most of his remaining life. 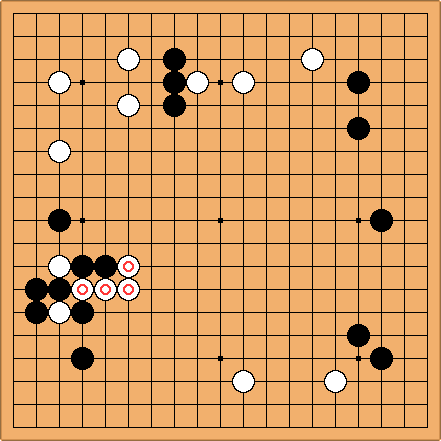 1894: Joseki Igo Shinpo (定石囲碁新法). Reference: 400 Years of Go In Japan & The Life of Honinbo Shuei. As first pointed out in John Fairbairn's works on Shuei. Reference: The Life of Honinbo Shuei. During the last ten years of Shuei's life over half of his games against other professionals were handicap games of 2-stones or greater, and his win rate in these games was over 45%. Spirit For some time now I've been very interested in Shuei's style. Much to my dismay I found that it's very hard to find any of his games records. I've managed to compile about 250 games so far, many from his early career. But he should have played at least 3 or 4 times as many. If anyone knows of a good source - electronic or in paper please let me know. My sgf collection can be found here: Shuei.rar. It contains many duplicates though so I advice to use Kombilo or some other database program. Velobici: This book 秀栄 日本囲碁大系 第17巻 contains 24 games commented by Takagawa (高川 格). Its the 17th volume of an 18 volume set jointly published by the Nihon Ki-in and the Kansai Ki-in. Bob McGuigan: That book is out of print, unfortunately. I have a copy and it's a wonderful book. A more recent book, published by the Nihon Ki-in as part of a seven volume series of books on great masters of the past, is this one: 流水秀栄―古典名局選集 but it seems not to be available from amazon.co.jp. Spirit I have a copy too (no. 17) and it's indeed a great book. I've searched on amazon.co.jp. But even with google translate it's not too clear what they are though unfortunately.